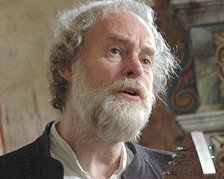 I'm very sad to report that David Kettlewell, harper, hammered dulcimer player, poet, humanist, academic and author of the first PhD on dulcimers and related instruments, passed away on Monday 4th April at his home in Bollstabruk, Sweden. The probable cause of death was heart failure. His funeral will take place on Wednesday, 20th April at 11 am at Tors�ker Church in Pr�stmon, near the Kramfors-Sollefte� airport in northern Sweden. There will be food and music to celebrate his life, during and after the ceremony. David Kettlewell had moved to Sweden in 1984 to take the role of head of music at a college. He was soon putting his musical and linguistic talents to researching and performing early Swedish church and choral music. He was a guest lecturer at four of Sweden's universities and for a period a professor at Tartu University in Tallin, Estonia. During the 1970s he was a familiar face at festivals and folk clubs in the South, performing with the band Trotto. From 1969 to 1970 David was on the Artistic/Organising staff of the English Folk Dance and Song Society in the South of England. As area organiser he founded the Christchurch Folk Festival, and produced a show � 'The Streams of Lovely Nancy', a seasonal song-and-word cycle which drew on folk songs and music collected in the south of England. The show was put on in Salisbury Cathedral in 1970. David almost single-handedly brought about the revival of interest in the hammer dulcimer. His extensive academic research, interviews with traditional players and recordings of their music formed the basis of his book on the dulcimer - All The Tunes That Ever There Were, which he published in 1975. The book was based on his dissertation - 'The dulcimer and related instruments with particular reference to traditional English music' - for which he was awarded Bachelor-of-Music-with-Honours by University of Surrey, Guildford in 1973. During his time at the University of Surrey he set up a Morris team, a folk band, two ceili bands and a ceili club. From 1973 to 1975 he was Music Fellow at Loughborough University, with Trotto, involving students and staff in music and dancing, a ceili band, Morris dancing, renaissance consort, student concerts and a festival and yet another 'Streams' show. In 1976 David received his doctorate as a Musicologist, from Loughborough University. He performed on dulcimer, clarinet, recorders, psaltery and harp in concerts and at folk clubs, and festivals, and played on radio and TV in Denmark, Sweden, Austria and Switzerland as well as in the UK. He recorded with Trotto, The Yetties, Ashley Hutchings, John Kirkpatrick and Jimmy Cooper and contributed to books by Bob Copper, The Yetties, Barbara Wood and Nibs and Jean Matthews. His articles appeared in Southern Arts, English Dance & Song, Early Music, and Sohlman's Musiklexicon of Stockholm. A champion of whole-person education, David encouraged people to find the music within themselves. He produced Baroque operas with people who believed they couldn't sing, and made learning fun by using his computer skills to produce multimedia presentations which complemented his teaching. Highly regarded as a Musician, Conductor, Musicologist, Author, Film maker, Web designer, Calligrapher, Font designer, Harper and Hammered Dulcimer Player, David Kettlewell was intelligent, generous and kind hearted and a good friend to many. He will be fondly remembered and sorely missed.